Something that many patients admit in counseling sessions is their tendency to snack late at night. More often than not, when people are snacking before bed, it is not out of hunger but for many other reasons. Late-night snacking choices are often unhealthy and can lead to unnecessary, extra calories. Here are some tips to help prevent late-night eating. Get enough protein and fiber throughout the day. Our bodies digest protein slowly, keeping our blood sugar in check and making us feel full for longer. 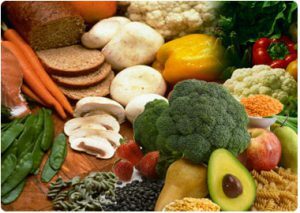 Our bodies can’t digest dietary fiber, so the effect is similar to protein. When we’re full and satisfied, we are less likely to crave those unhealthy, high-carb, and high-fat snacks. Women should aim for at least 65g of protein per day while men need at least 80g. As far as fiber goes, you can get the recommended 25g-35g per day by including fruits, vegetables, nuts, seeds, legumes, and whole grains in your meals. Get enough sleep. Lack of sleep disrupts appetite hormone levels, which help regulate satiety and tell your brain you are full. Not getting enough sleep can cause us to confuse being tired with being hungry. Aim for between 7-9 hours each night. Stay hydrated. Similar to lack of sleep, our body can misinterpret being thirsty and dehydrated as being hungry. Ensuring you get enough water throughout the day will help keep these false hunger pangs at bay. Drink at least 64 ounces of water per day or ideally, aim for half of your body weight in ounces. For example, a 160 lb woman should aim to drink upwards of 80 ounces per day. Don’t forget that fruits and vegetables contain water so including those in your daily diet is important. Practice mindful eating, especially at dinner. Screen time has been linked to increased food intake. 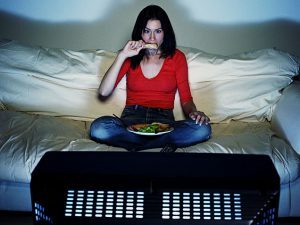 Eating in front of the TV, while playing video games or surfing the Internet can distract attention from what and how much is eaten. It also may reduce satiety signals sent to the brain, causing you to feel hungry quicker than usual. At dinner, turn off the TV and smartphone, sit at the table and enjoy your food so you feel full and don’t want an after-dinner snack. Always ask yourself, “Am I really feeling hungry? If the answer is, “no,” then put away the food. Many people eat out of boredom, stress, fatigue or habit. All of that leads to making unhealthy choices and overeating. If the answer is yes, think about what you had throughout the day to see if you met your protein goal and had enough high-fiber foods. If something was missing from your day, go ahead and eat a small portion of that item. Portion control is key if you do choose to have an after-dinner snack. Portion out a serving of what you’re eating and sit down at the table in the kitchen before you return to what you were doing.